More than 20 years have passed since Nelson Mandela was released from prison, yet many – if not most – South Africans still labour under the falsehood that apartheid was a kind of Frankenstein creation spawned by Puritanical Afrikanerdom. It was anything but. Scholarship on the origins and ideological praxis of apartheid has tended to focus on the political rise of the National Party in the years leading up to 1948 as a kind of spontaneous flowering of racial hatred directed at black South Africans. Unless we search for the truth behind this terrible chapter in South Africa’s history, schools will continue to spout half-baked slogans as a substitute for actual history. That would be a pity. One need only read pre-apartheid South African history to know that racial harmony was fairly common in many parts of the country where government influence was weak. Lawrence van der Post in Lost Sands of the Kalahari writes that he never witnessed apartheid in practice until he visited Natal as a young man in the early 1900s. 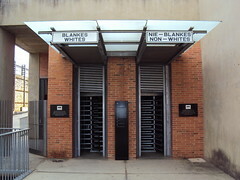 Throughout much of the 1800s, commerce, trade and even inter-marriage between black and white was fairly common in areas such as the Eastern Cape. Yet it remains true that most groups do practice some form of discrimination, however benign, in favour of their own. Muslims and Jews prefer to marry within the faith, though even here the tendency is towards assimilation. Apartheid, however, was something entirely different. It was an effort to define a person’s identity in terms of racial science – hence, the ridiculous “pencil test” in the hair to determine whether a South African was black or white. The story of apartheid is one of racial science. Most South Africans have heard of Hendrik Verwoerd, who is generally credited as the architect of apartheid. He left for Germany in 1926 to study at the universities of Hamburg, Berlin and Leipzig, around the time that Nazi ideology had congealed around the failed artist, Adolf Hitler. Verwoerd was swept up by the radicalism of the Nazis though – and there is some dispute about this – he distanced himself from the Nazi obsession with racial genetics. He saw no real biological differences between the races, believing environmental factors were behind the “development of a higher civilisation by the Caucasian race,” as historian Herman Giliomee points out in his recently published book The Last Afrikaner Leaders. Giliomee does not dwell much on the cult of racial science, perhaps assuming that its role in shaping Afrikaner politics in the last century is over-stated or now irrelevant. If Verwoerd has achieved infamy as the architect of apartheid, fewer South Africans know of Francis Galton, the father of eugenics – defined as the study of improving genetic stock by selective breeding of humans, in much the same way that farmers do with cattle and sheep. Eugenics was considered a respectable science until well into the 20th century, and was taught in universities around the world. Based entirely on quack science, eugenicists were astonishingly effective in advancing their programmes at government level. Despite Verwoerd’s public pronouncements dismissing biological differences between the races, eugenics gained huge traction among influential segments of the academic and political elite, in South Africa and elsewhere. The consequences were catastrophic, from South Africa to the United States and Europe: genetic screening, forced birth control, IQ and aptitude testing as a form of exclusion, Bantu education, racial separation, compulsory sterilisation, forced abortions, and – as in the case of the Nazis – racial genocide. Whether one is an atheist or person of faith, such a remark should be cause for concern. By banishing the soul of man, Wundt decreed man to be little more than a stock animal, to be shepherded and slaughtered at the whim of the master. Otto von Bismarck, the great Prussian military adventurer, found inspiration in Wundt’s teachings, and that helped lay the foundation for World War One and Hitler. In a slightly different vein, Verwoerd seized on the Old Testament as evidence of God’s injunction to keep different races apart. Social engineers are always looking to science, or the bible, to rationalise their innate hatred of others. Few people will openly admit to any association with eugenics today, yet eugenics programmes survive in less offensive cloaks, such as family planning clinics (intended solely for the poor and ill-educated), planned parenting and “voluntary” sterilisation programmes. Free circumcisions are now being offered to men in South Africa as a form of Aids prevention. The ads are running daily on the TV. This is seen as sacrilegious among many black men, since circumcision is a part of an ancient coming-of-age rite. What he is saying is that black South Africans had better wake up. All of these interventions being offered in the name of help are being directed at them, not at whites, nor the black middle class. These programmes are always directed at the unwanted. This is not to say that South Africa is sliding back into the dark age from which it has just emerged, but it does suggest the social engineers – black or white – never sleep. Open this door of racial or social engineering even slightly, and see what pops out: in the not-so-distant past it was the apartheid death squads; Wouter “Dr Death” Basson, former head of the apartheid chemical and biological programme and his search for an “ethnic weapon” that would target blacks (”That was the most fun I had in my life,” he told documentary film maker Bob Coen in 2009); Aubrey “Dr Shock” Levin and his apartheid-era electric shock treatments to cure gay white soldiers and conscientious objectors (Levin, now living in Canada, was charged last year of – wait for it – sexually assaulting upwards of 30 males). Open this door and this is what you get: mad scientists and security bumpkins with guns and no brains. Open this door a little more and you have sterilisation programmes aimed at poor, black women, paid for and administered by the government. You have government bullies tearing down shanty towns, as they recently did in Lenasia, Johannesburg, targeting the most desperate and poor among us. It always starts with the dehumanisation of the “unwanted.” Last week we had wild life documentary film maker David Attenborough saying the world was over-populated. That’s right David. Let’s clear the planet for the animals. I always wondered about this over-population buzz. Having flown the length of breadth of Africa, all I see is empty space. Where are the people? In Congo’s Katanga province, I’ve seen hundreds of square kilometres of some of the best agricultural land anywhere with nothing but grass growing on it. Why? There’s enough food for the local people, and no way to export any surplus from this remote region. Over-population is another nonsense scare spouted by people with agendas. They are the same crew as before: the social engineers, mad as hatters, but with polished accents. I suspect they simply dislike people and want them to go away, only they want others to do the dirty work for them. Let’s call it what it is: eugenics for the modern age.